A job so rewarding… some say it’s a calling. 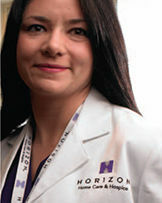 Horizon offers an abundance of nursing choices for your career path. Hospice Nurses embrace the unique challenges and rewards of caring for end-of-life patients. Our Care Coordinators represent Horizon at our partner hospitals to facilitate seamless discharge planning. Our Home Care Case Managers enjoy being "out-and-about" road warriors traveling throughout their communities to provide hands-on healing to our valued patients. Family Care Nurses promote preventative care with a holistic approach for members of the geriatric Family Care program. Additionally, our office employs Utilization Management Nurses, Educators, and a family of Intake Nurses. Regardless of your position, all Horizon nurses participate in a comprehensive orientation program typically including classroom and computer training, an assigned preceptor, shadowing, and joint visits all designed to help you adapt smoothly and successfully to home care. Horizon hires diverse backgrounds from new grads to extensive non-home care experience, and the duration and components of the orientation are tailored to both the job requirements and your individual needs, to enhance your personal progress.